← Filmmaker Christen Hepuakoa Marquez visits ʻUluʻulu! October is American Archives month promoted by Society of American Archivists (SAA) as an opportunity for archives and archivists around the country to raise public awareness about the value of historical records and collections. For more information go here. In celebration ʻUluʻulu will be co-hosting special screenings throughout the month of October check them out! 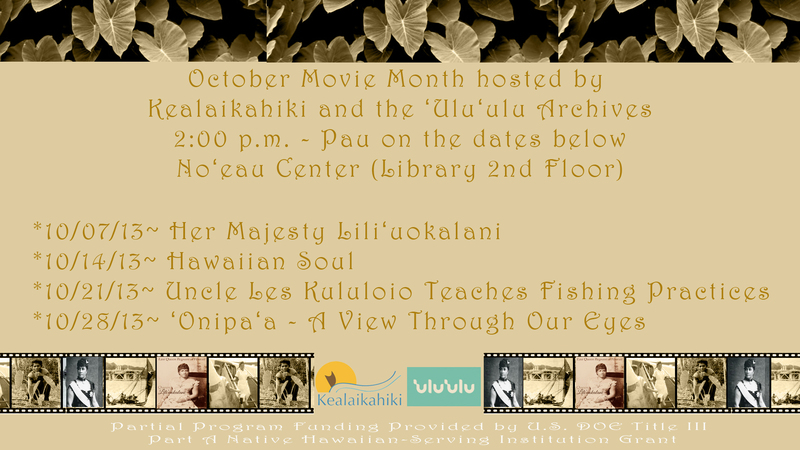 In collaboration with Kealaikahiki: Native Hawaiian Program, ʻUluʻulu will co-host “October Movie Month Mondays,” to promote Hawaiian culture and identity for Hawaiian and non Hawaiian students. These events perpetuate Kealaikahiki’s mission which strives to promote “student success while being culturally responsive to the indigenous culture of Hawaiʻi, including culturally relevant ways of knowing.” A film from the the archive will be shown every Monday of October (Oct.7, 14, 21, 28) at two PM in the Noʻeau Center. See flyer above for film titles. 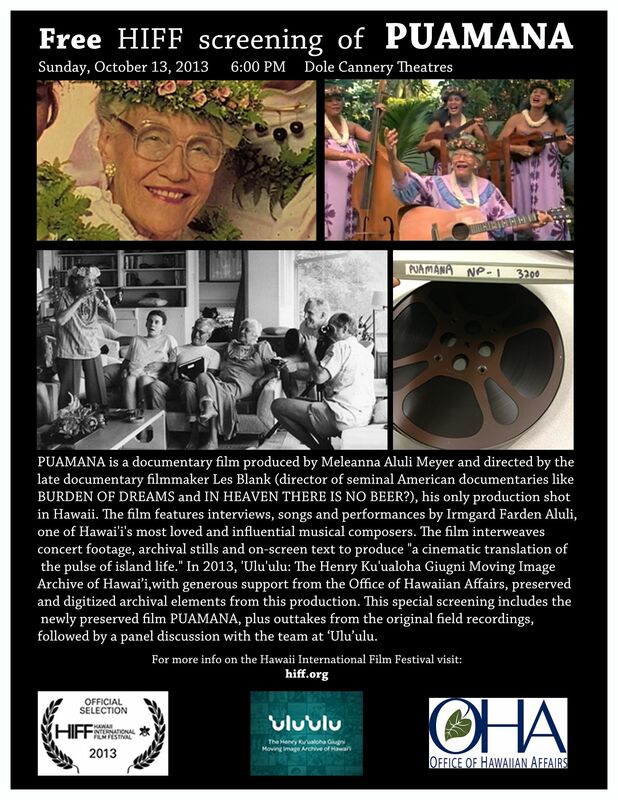 We are also proud to announce that this year in collaboration with The Office of Hawaiian Affairs (OHA) we will be showing the film Puamana at the 33rd Annual Hawaii International Film Festival (HIFF). A documentary produced by Meleanna Aluli Meyer and directed by Les Blank, the film documents Puamana the music group fronted by the late Irmgard Farden Aluli. The film will be screened at Dole Cannery Theatres on October 13 at 6 PM and is free to the public. Donʻt miss this special event which includes screening of production elements and a discussion panel. For more information see flyer below and see trailer here: Puamana Trailer.